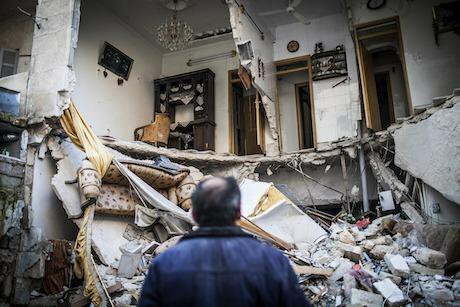 A civilian looks at a destroyed home in Aleppo, Syria. Andoni Lubaki/AP/Press Association Images. All rights reserved. Counter-revolution in the Arab world has been in the ascendance. From Egypt, where the military regime has all but vanquished its opponents; to Syria, where the regime, at the horrific cost of literally destroying Syria, has managed to shift the tide of war in its favor. Even though counter-revolution was always superior in the material sense, it has shown a marked weakness ideologically; a feature that it has in common with its revolutionary opponents – a marked failure, that is, in producing an encompassing vision of the society that they are promoting. There has been a marked reliance on defining themselves in relation to their opponents, labelling the opposition everything from “terrorist” to “anarchist” without offering justification for their right to rule. Rather than offering a credible alternative to the opposition, they remain in a myriad of the rhetoric of “security”, “war on terror” and the constant demonization of their opponents. As such, both the forces of the status quo and the opposition are rejectionist in nature. The counter-revolutionary forces share the same weak roots in intellectual development as the revolutionary forces, namely the weakness of capitalist development in the Arab World. As I have discussed often in this column, capitalism was largely imported during the colonial period, which distorted the local development of native capitalism. This distortion led to the development of a weak bourgeois, which was unable to challenge the state, and resulted in a weak development of class consciousness amongst the masses and the bourgeois. This condition also had another side effect, namely, the lack of separation between, what Charles Tilly aptly calls, the wielders of coercion and the wielders of capital. Those that controlled the state and its coercive apparatus were also in control of national capital, creating a total merger between the Arab capitalist class and the apparatus of the state, with its violence and coercion. This is clear in the case of Egypt, where the military not only controls a large part of the economy, it also directly controls the organs of the state. This direct control means that the need to provide ideological justification for the rule of the Arab military capitalist class switched from providing a vision for societal development and the creation of cross-class alliance, to invoking the purpose of the existence of the state, namely the provision of “security”. Thus, the use of conspiracy theories, terrorist threats, and fights against foreign power became a staple of counter-revolutionary rhetoric. On the other hand, this state of affairs inhibited the development of class-consciousness of the capitalist military class, due to the lack of prolonged class conflict and the need to build cross class alliance. This was replaced with institutional consciousness, where the ruling elites self-defined themselves as the state itself, which has been taken to represent the nation. This has been reflected in the rhetoric used by the counter-revolution to discredit its opponents. It spread fear, not of social change, which is undesirable in itself, but of the destruction of the state by the forces of chaos. The battle is framed as the struggle between the forces of “chaos” and “order”, not two competing social visions. Based on this, the need for intellectual development becomes rather limited. The existence of the state does not need sophisticated justification, due its deep roots in the modern collective psyche. The ruing elites also deliberately mix the state with the nation, so an attack on the current order becomes an attack on the state and by extension the nation. This level of intellectual poverty has created a cult of state worship mixed with extreme nationalism amongst the elite as well as their middle class supporters. The ideological base of Arab autocratic regimes has become the same as the ideological justification for the existence of the state, namely, the provision of security and avoiding, what Hobbes called, a brutish, short life of all against all. In other words, the ruling elites have adopted the view that without them the state would collapse, opening up the way for chaos. As such, political opposition does not only become an act of treason, it becomes a call to barbarism and anarchy, which the forces of order must suppress at all costs - making the battle existential. At the same time, there is no need to develop a cohesive ideological framework, since, simply put, what is at stake is the existence of organized society itself and under such conditions, the form of this society does not matter much. This sense of consciousness, has not only had an impact on the intellectual development of the status quo forces, it has also affected the policies of repression being followed by those regimes. The most prominent example of which is the case of Syria, where the regime has embarked on a literal war on its opponents that has not only destroyed Syrian society, but severely curtailed the ability of the regime to govern as well as the ability of the ruling Syrian class to extract resources and accumulate wealth. From a class perspective, this policy seems to be almost suicidal. The regime opted for an all-out war rather than a possible compromise with its opponents, which would have guaranteed the ability of the ruling elites to continue to accumulate wealth. Even if the regime is able to win the war, the local governance apparatus that the regime has relied on has been destroyed in most parts of Syria, as for example in the city of Idlib. From an outsider’s perspective, the Syrian ruling class has opted for something that is contrary to its rational class interest. This, once again, stems from the lack of class-consciousness of the ruling elite. They see themselves as the state with all its manifestation of power, rather than a social class that is mainly concerned with capital accumulation. From that perspective, opposition is equivalent to anarchy and the need to crush it becomes paramount. Another example of such self-destructive policies can be found in Egypt. The military regime has advocated economic policies that have pushed the country into a full-blown fiscal crisis. The Egyptian pound is rapidly de-valuating, which is pushing inflation and rapidly increasing the cost of living. This crisis stems from the aggrandizement of the military’s economic empire, which has not only crowded out the private sector, but also depleted the country’s foreign reserves in massive, economically useless, infrastructure projects that benefit the military as it is directly involved in these construction projects. This, once again, seems to move against the class interest of the military caste, which should revolve around the stabilization of the Egyptian economy and the creation of conditions conducive to capital accumulation. However, this has been trumped by this class seeing itself as the state. As such, anything that benefits it is essentially beneficial to the state, and therefore the nation. This policy is compounded by an increase in defence spending, which has depleted whatever was left of the hard currency reserves. This spending spree made Egypt the fourth largest arms purchaser, worldwide, in 2015. The weakness of the counter-revolution’s intellectual development has created a strong dilemma. The philosopher Miguel Unamuno captured this in a letter to a friend during the Spanish civil war in 1936. He discussed the sweeping victories of Franco and the Spanish right, and wrote, “In this way there will never be peace. They will win but they will never convince; they will conquer but they will never convert”. The inability of the counter-revolutionary forces to appeal to more than the need for security, and attachment to the state, means that the current political order can only be maintained through the use of coercion and violence. This, in the end, will not only negatively affect other classes, it will also affect the ability of the ruling classes to accumulate wealth as the autocratic regime tears societies apart, due to their overreliance on violence in pursuit of the interests of a quite mythical figure: the state!